Hello Monday and welcome to #IDS18! 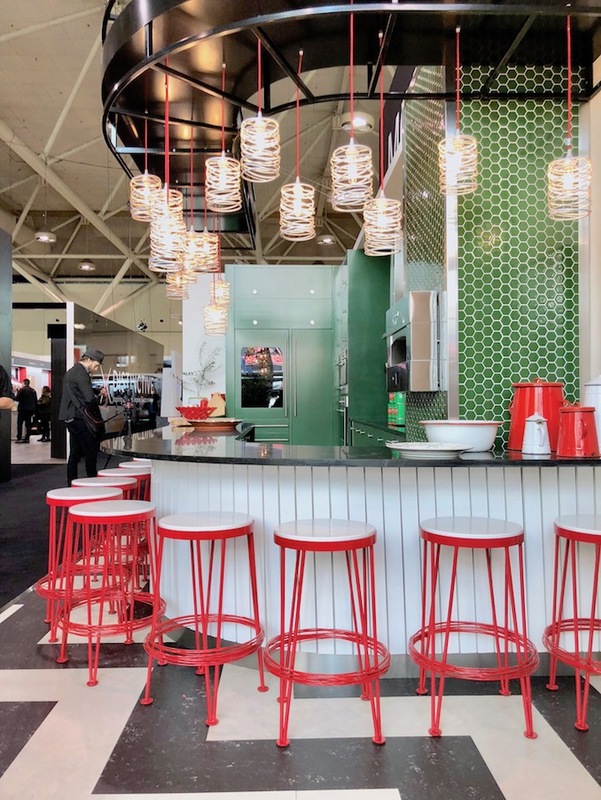 In case you weren't in Toronto last weekend, the Interior Design Show was in town and I surely was blown away by many exhibitors with their creativities, attention to details, and the fantastic products they brought to the show this year. 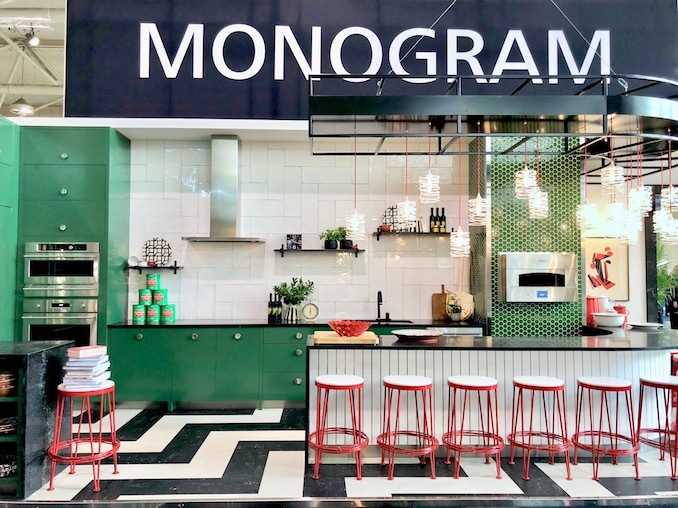 Being a big fan of Sarah Richardson, I was beyond excited to learn that Sarah has teamed up with luxurious brand, Monogram Canada, to create not one but two signature kitchens at IDS18 to showcase the latest in kitchen appliances and to inspire us to reimagine the heart of our homes. 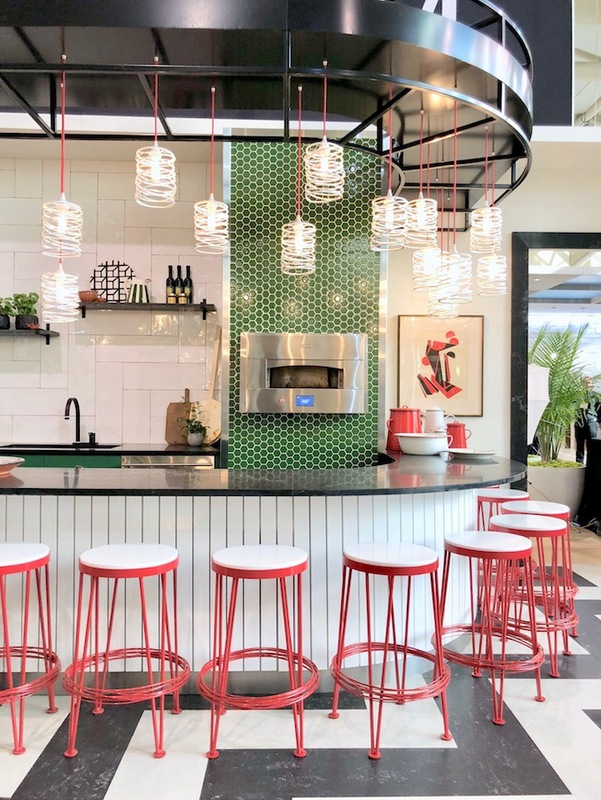 Today, we are hanging out at bold and colorful Couture Pizzeria! Have trouble nailing down a game plan for a tight linear space? 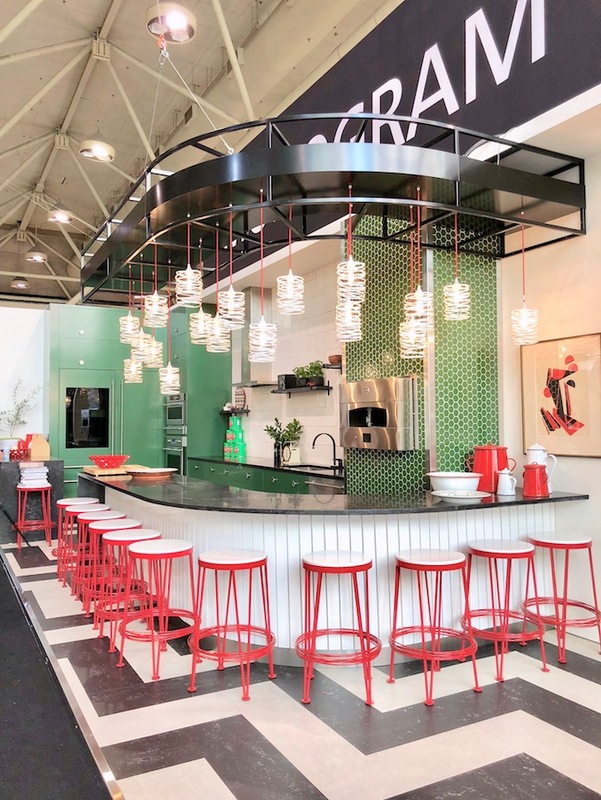 Here is how Sarah injects vibrant colors / personality and maximizes the use of every square inch to deliver a dream kitchen, pizzeria style, right at IDS. From the sleek curved counter outfitted by matte black Caesarstone with crisp white beadboard detail, the spiral nest motif and vibrant red accent on the pendants and the bar stools, the mod black and white chevron floor, to the gorgeous indoor pizza oven (it heats up to 800C in just 30 minutes and that's how you get that delicious crispy crust) and of course the eye catching glossy green on the feature wall and the cabinets, what's not to love? Lets check out the rest of the kitchen shall we? 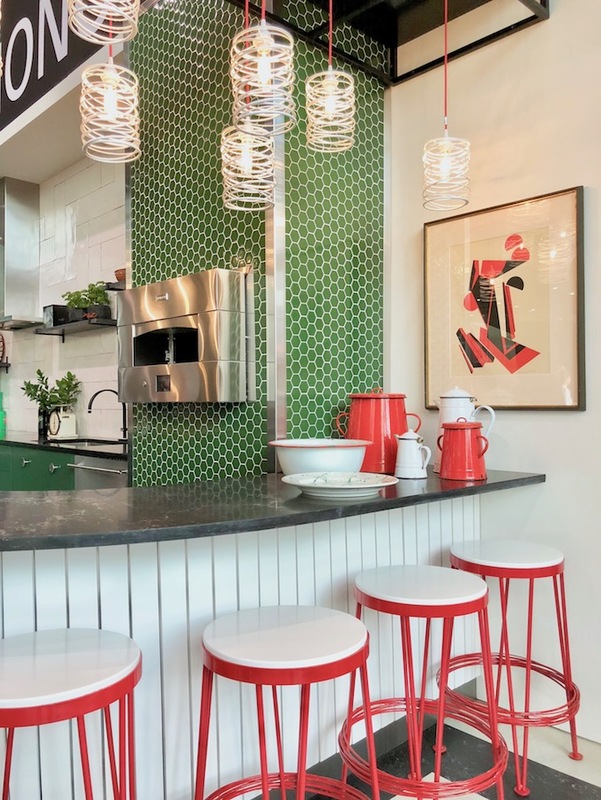 Sarah is famous for her ingenious kitchen designs and this spectacular narrow kitchen features many similar qualities in today's small space living that we can all take notes of. 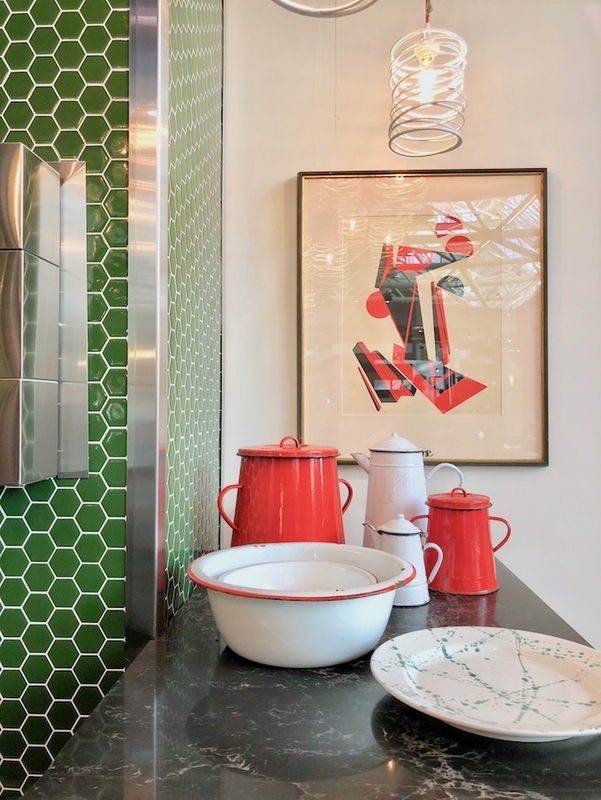 Common issue in new build: limited linear feet to house a french door refrigerator, an oven, a microwave, an induction cooktop, a sink, a dishwasher + practical storage / counter space without sacrificing style. Sounds familiar? My pre-construction project has the exact same problem. 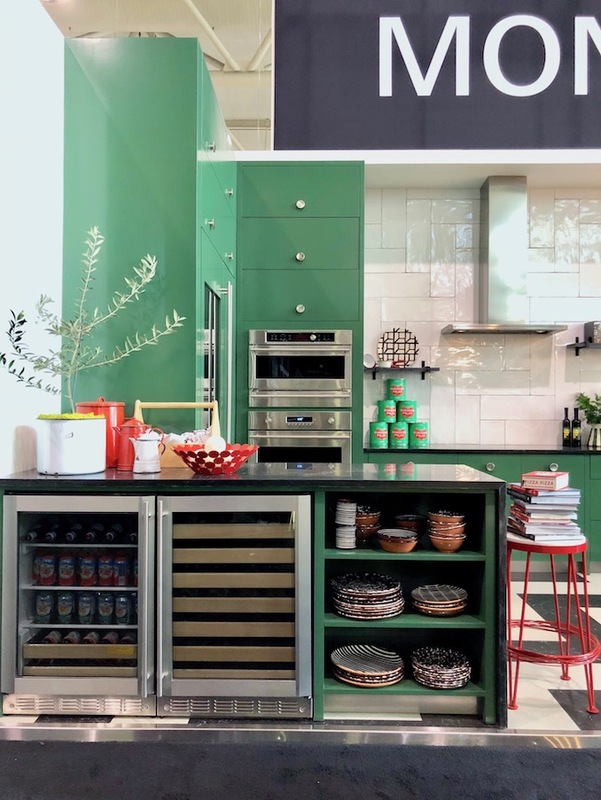 I love how Sarah positioned the fridge on the side wall and incorporated a peninsula for counterspace + storage. #clever! 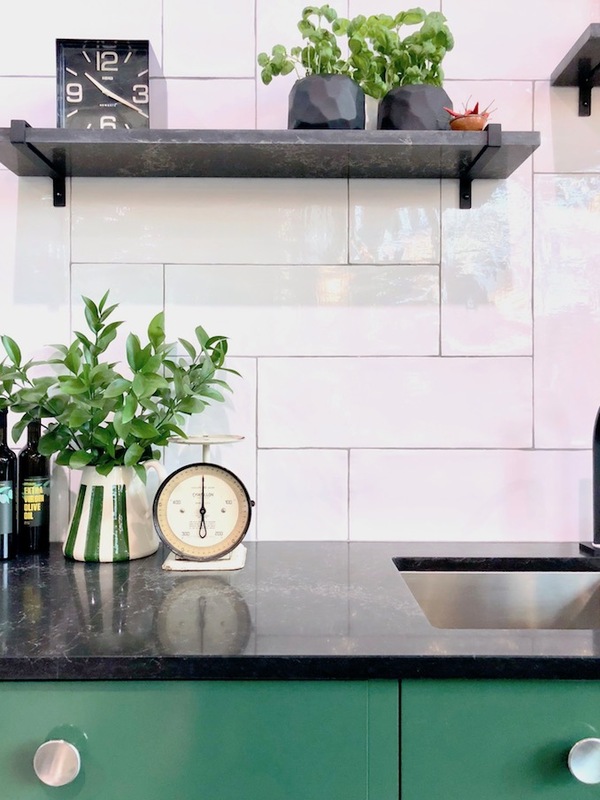 I love induction cooktop and this one from Monogram Canada can be installed flush to the countertop for an ultimate seamless look ... well worth the investment. 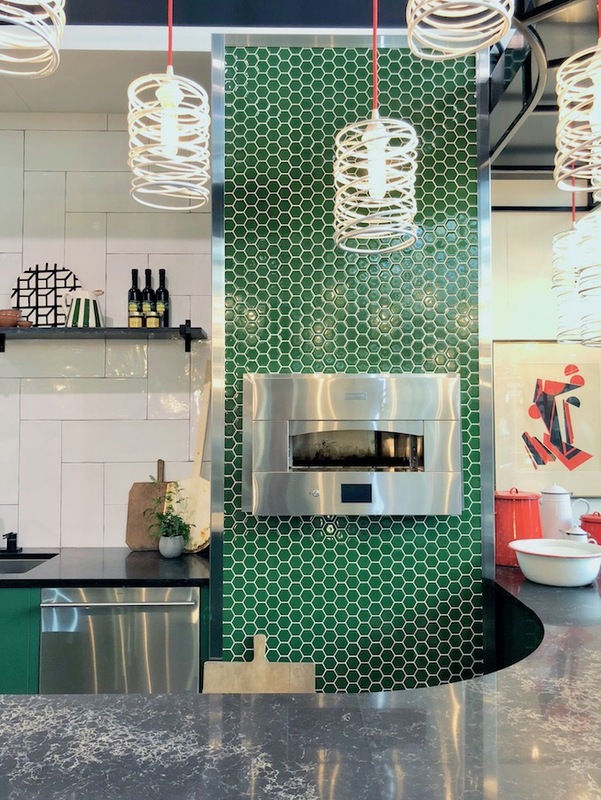 To balance the budget, why not installing well-priced glossy white tiles in an intricate pattern to add visual impact without breaking the bank? 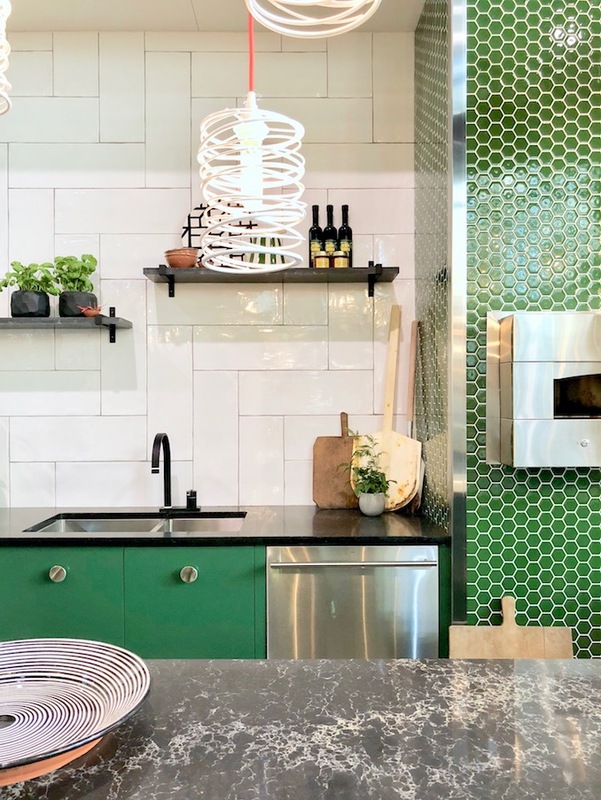 In case you didn't to experience this gourmet kitchen in person at IDS, here is a fantastic walk through with Sarah at Couture Pizzeria! 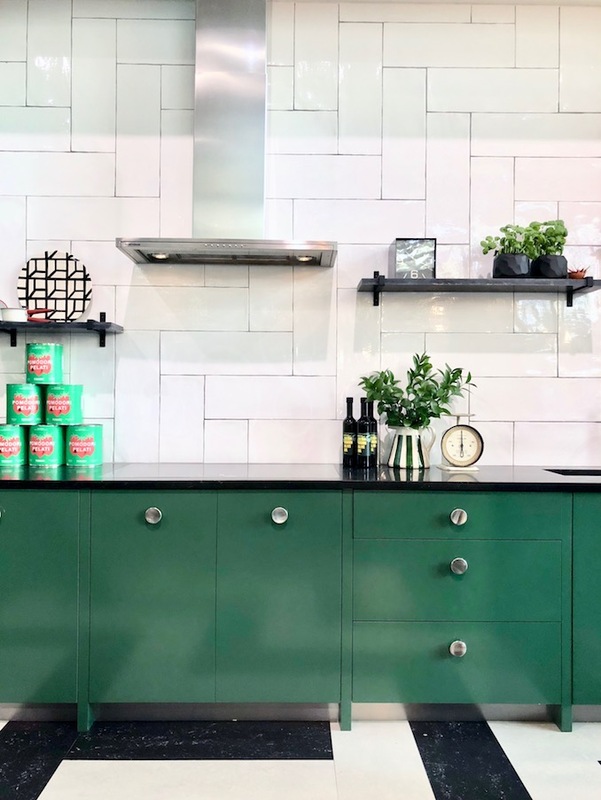 Thanks Sarah for yet another beautiful and inspiring kitchen! Come back on Thursday and I will take you to Sarah's Resort Kitchen. You won't want to miss it!